Women building their own city. Lubis is the owner of one of the 98 life-size, concrete realizations of those little cardboard houses and one of the leaders of the Liga de Mujeres Desplazadas (League of Displaced Women). The organization’s efforts have built a community known as the City of Women, to restore the right to housing to some of its most vulnerable members and their families. 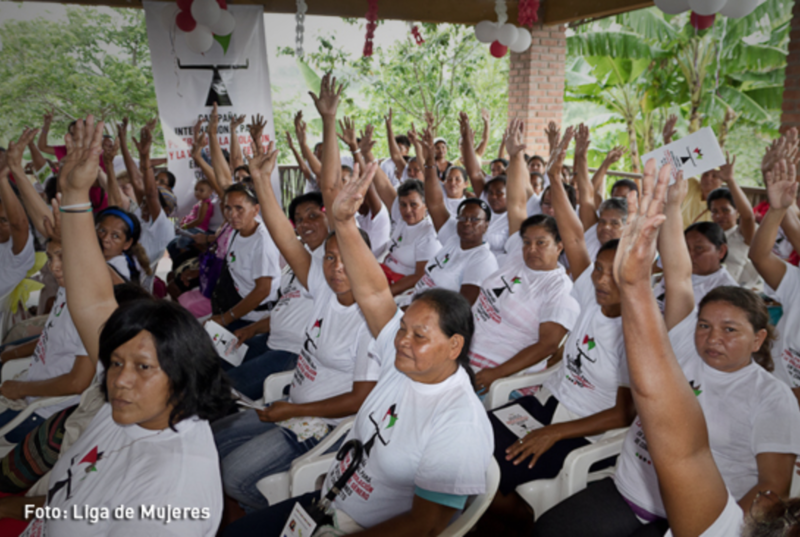 Based in the northern region of Bolivar, the Liga is a grassroots group run by and for women affected by the conflict between the government, right-wing paramilitaries, crime syndicates and leftist armed rebel groups, such as FARC, a battle that is still ongoing despite a peace process which began in 2012. The six-decade long conflict in Colombia has displaced more than six million people, effecting Indigenous and Afro-Colombian communities in particular. While most of the combatants in this war’s armed factions are men, more than 50 percent of those forcibly displaced by it are women. It is estimated that half of these have experienced sexual violence: perpetrated systematically mainly by paramilitary groups, but also by state forces and rebel groups. “My town was [a big producer of] palm oil. They burned cars, did their best to make people leave, and now the multinationals can buy very cheap land because no one lives there,” says another Liga member. Survivors of this violence typically settle in impoverished shanty towns on the outskirts of Colombia’s major cities, where they live in informally constructed shelters without access to clean water or healthcare – let alone employment, support networks or processes of justice. El Pozon, located far from the five-star hotels and postcard-perfect tourist attractions of Cartagena, on Colombia’s Caribbean coast, is one such neighborhood. With about 100,000 inhabitants, it is Cartagena’s most densely populated borough, having received a steady influx of internally displaced people over the past 50 years. This marginalized population live in precarious homes which are hand-built from cardboard, tin and plastic sheeting and are not equipped to withstand the region’s periodic floods. It was in El Pozon that the Liga was founded. Some of the women displaced there began to organize around what they termed their “Sueño de vida digna”: dream of a dignified life. “Everyone – including our own partners – said that we were crazy,” says Eidanis, another Liga leader. “[They told us] that this project was impossible. But we demonstrated that it is possible … It’s the only housing project belonging to female victims in the country.” She says this with pride, from the terrace of the house she now owns in the City of Women. For Eidanis, an important part of the league’s work is in ensuring that the state takes responsibility for looking after the needs of displaced and abused women. It is almost a decade since its completion, and the city now has its own small primary school, a community center, and a few informal shops selling food and household essentials, which are run from the women’s living rooms or by the roadside. Each of the brightly painted houses has its own front terrace, furnished with rocking chairs and close enough to the neighbors to allow them to talk over the noise of children playing soccer or chasing chickens through the mango-tree-lined avenues. Construction of the city began in Turbaco – a municipality on the outskirts of Cartagena – in 2003, thanks to international funding secured by the founder and lawyer of the Liga, Patricia Guerrero. In 1999, this former judge and Colombian feminist activist, founded the League of Displaced Women, through which she helped thousands of women and their children victims of violence. Years late,r she also founded the City of Women. Specializing in International Humanitarian Law, Patricia also managed to have the Colombian Constitutional Court decree special protection for displaced women victims of sexual violence. Eidanis describes how the construction of the City of Women was managed collectively. In an organization that was by then five years old and already 300 strong, the collective effort to build the city solidified its foundations. While some women built and laid bricks, others tended the crops grown on site to sustain the community. Some were responsible for collective childcare, others cooked the meals. “It was something that brought the organization even closer together, us living and working together like that, day by day,” Eidanis recalls. 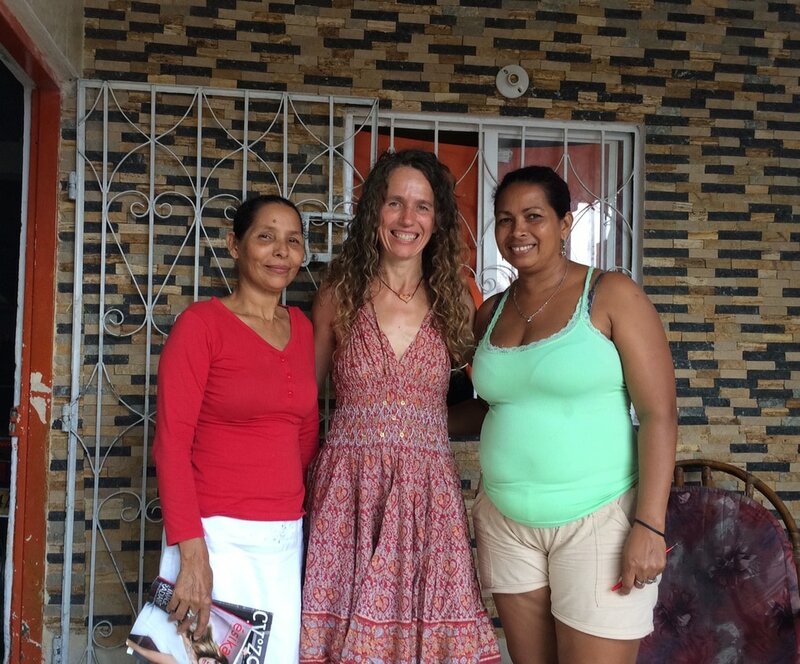 Ana Luz (lf) and Eidanis (rt), two of several leaders of Liga de Mujeres, together with Ilonka of Positive News, in front of Eidanis' home.